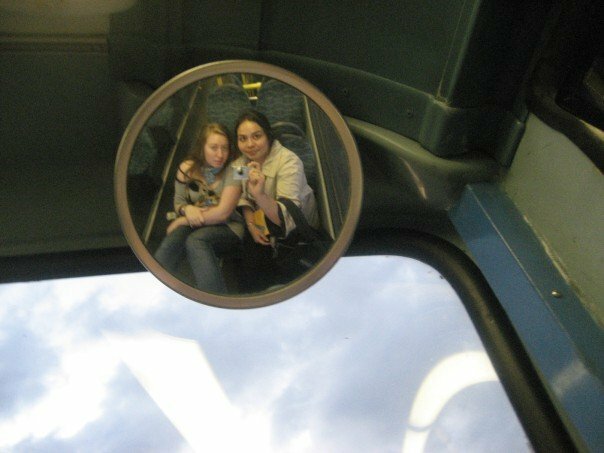 Anne and me on one of our many bus quests around London, summer 2007. It hit me at around 4 this morning, when I really wanted to be sleeping off the numerous G&Ts downed at my leaving party: In a matter of days, I will be back in the UK… and back to my old life in London? Well, obviously not. I have no idea what to expect. Will it be hard? Will it be wonderful? Who knows. Sitting at the front, on the top deck of a double-decker bus. Hearing one of my favorite songs in a pub. Nursing a hangover with a greasy spoon fry-up or a Sausage Egg McMuffin. Buying a bottle of wine for a fiver. Buying snacks from Marks & Spencers. Staring at the Thames on a sunny day. Watching a musical at the West End. Shopping for shoes and finding my size in a style I like. “Cheap” Top Shop and Oasis clothes. Ordering books from Amazon and receiving them days later. Not ever being asked if I want my water “hot”. Getting milk with my tea, without asking. Cooking most of my own meals. Texting on a cellphone that isn’t completely maddening. The relative smorgasbord of cute guys who are unlikely to be obsessed with Indonesian girls. I already have an idea of what I’ll miss about the Big Durian, but I’ll save that for next week, when I have the benefit of time and space to aid my perspective. #9 - Spot the Miracle. 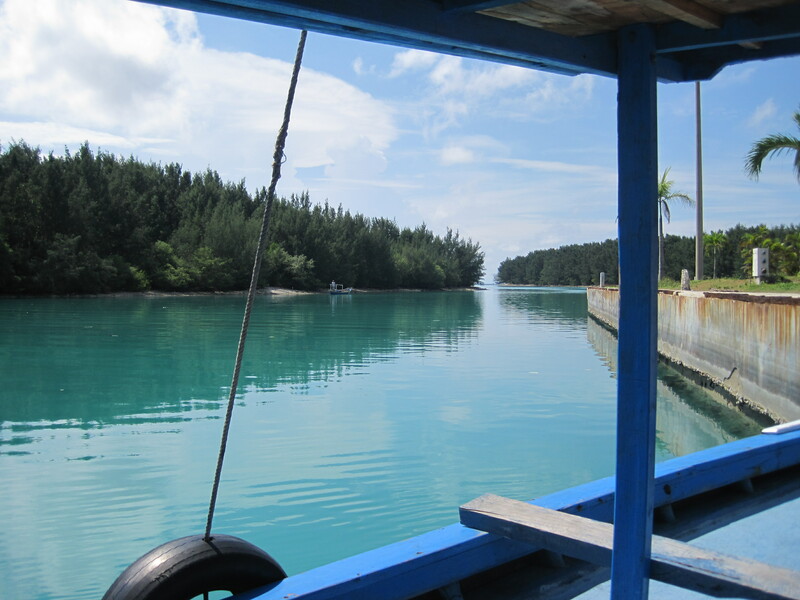 En route to Pulau Seribu. Look carefully and you'll see a man walking on water. From last Sunday to Wednesday I was in, on and around the Pulau Seribu (Thousand Islands) with Berkeley and her boyfriend Garcia. 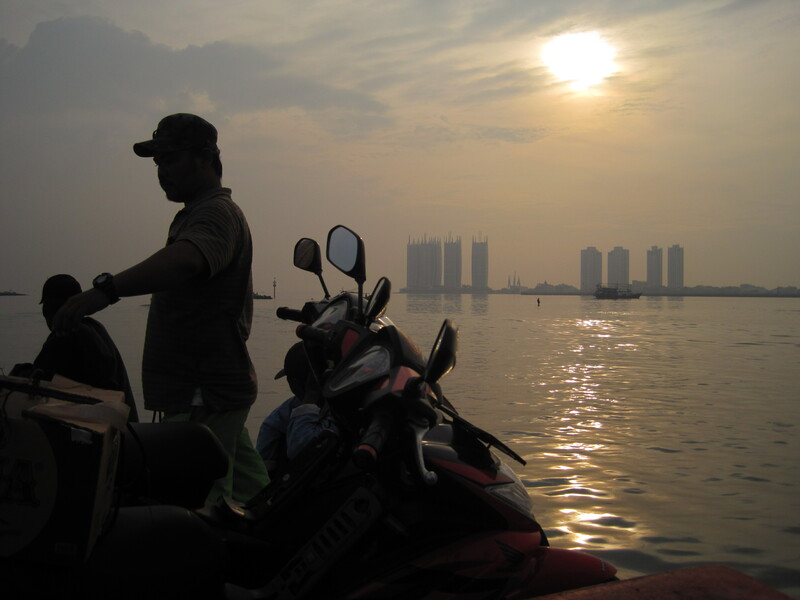 I adore boating, and although I was asleep for much of the two-hour journey (no sleep, early start) there, I enjoyed watching Jakarta quickly disappear and the expanse of water envelop us… not so much the piles of trash that drifted out for miles and miles. I can’t remember the exact name of the island – the fact I couldn’t pronounce it didn’t help – but I dubbed it the Isle of Cats, because it was just full of felines! Most of the island cats looked well-fed - probably thanks to fish - this was by far the mangiest. He didn't respond well to my papping. #12 - Feed Me. 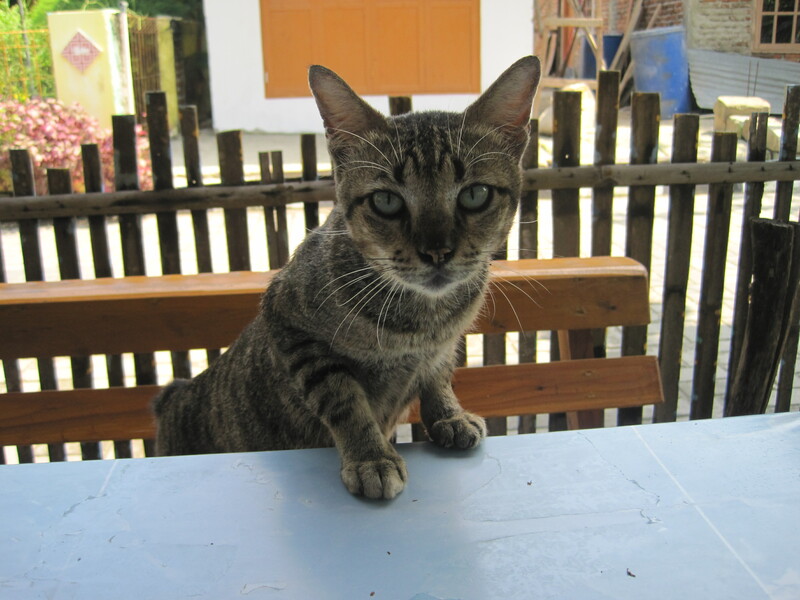 A far less mangy cat that wanted to share my "brunch" of rendang, fishcake and rice. I did not oblige. 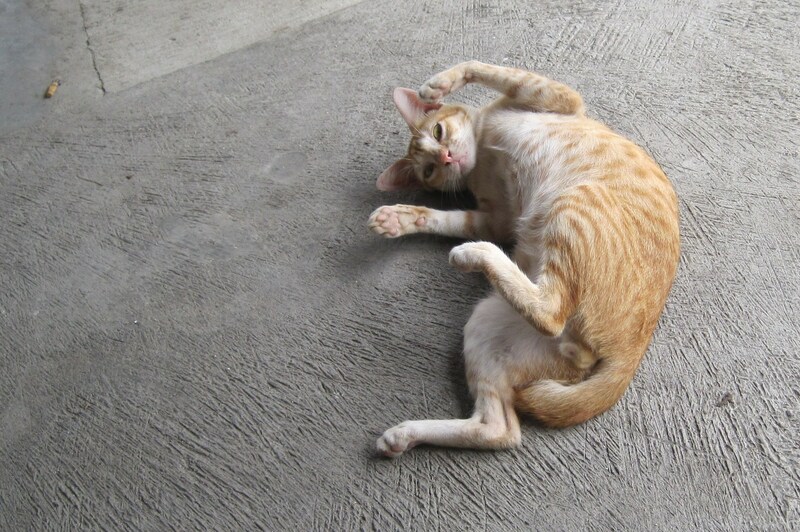 This cat was really enjoying itself, twisting this way and that. 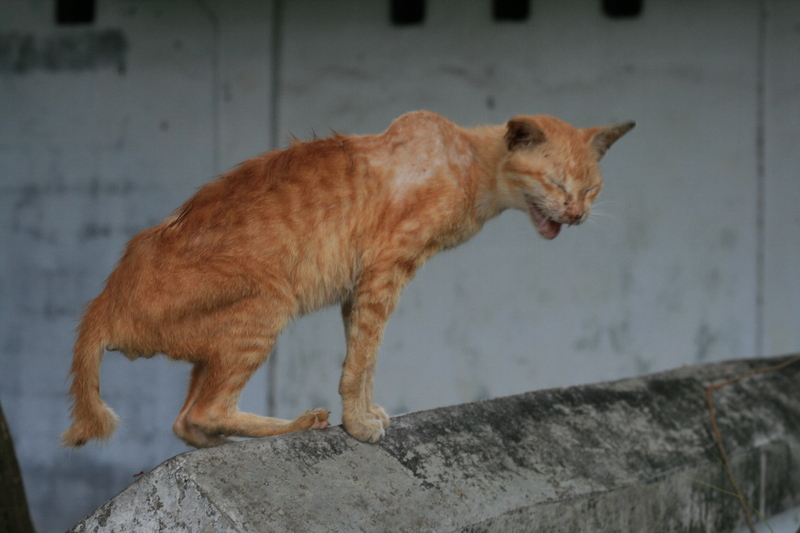 It looked just like Lucky, my second cat, who was apparently decapitated by a gate awhile after I left Cambodia in 1997, down to the stubby tail. 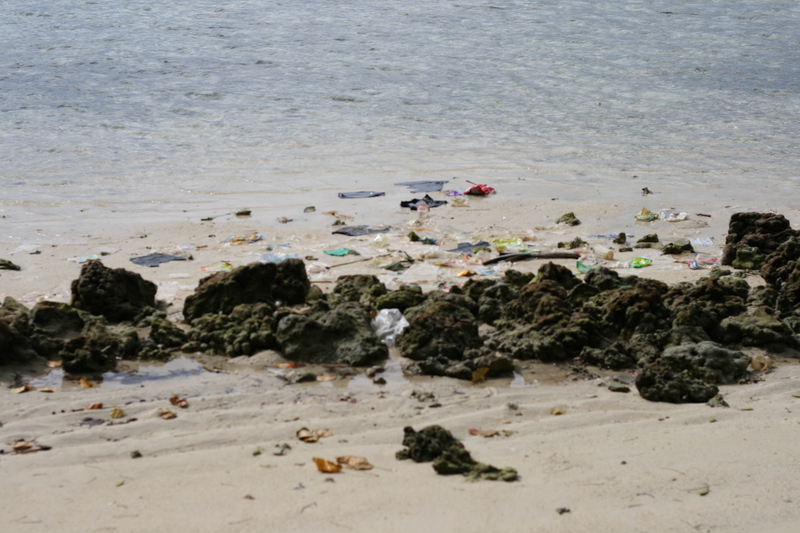 Unfortunately, our island wasn’t the kind where we could wake up and chill on the beach… there wasn’t one, so we took boats to prettier islands, which sadly also had their fare share of trash. #10 - Blue Lagoon. Berkeley and I were waiting for coconuts harvested from an island owned by one of Suharto's cronies. Dirty Beach. Damn you Jakarta litterbugs! #11 - In the Pink. View from our island after a lovely day of tanning, swimming and boating. I planned to finish my transcriptions while there, to make up for a lack of productivity before the trip (urgh), but I didn’t get anything done, as there was no electricity during the day, and my netbook runs out of juice quickly. (Excuses, excuses.) But I did feel very inspired when it came to the Story, and delighted in scribbling in my moleskine. The in-progress first draft of the Story. Very windy night, so the pages were turning themselves. I’m planning on writing both the first and second draft by hand, which people have described as masochistic… but I’m finding it effective. On the netbook, I’m too tempted to surf the net. 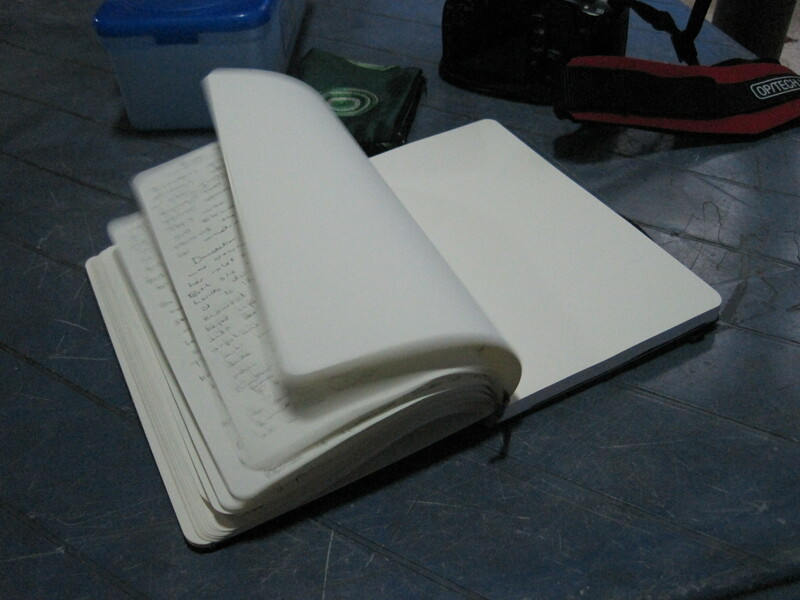 With the moleskine, I have nothing but beautiful, blank pages to fill with my imagination and scrawl. I wrote an entirely new chapter, plotted out all the chapters, and combined what was meant to be two chapters into one. I also realized I wanted the characters to write letters to their families throughout the narrative, which would provide humor and more characterization – I love epistolary tales. I also got a good chunk of reading done… it’s almost like I’ve had ADD lately, but being surrounded by nature (and deprived of internet) did wonders for my concentration. I didn’t feel “refreshed” at the end of the holiday, but I was glad I went. As well as the creative writing and book-devouring, I acquired a patchy tan and spent quality time with Berkeley and Garcia. I quite enjoyed being the third wheel… I could be alone as much as I wanted and not feel bad about it – and then enjoy their company in high enough doses to stave off loneliness. The rest of the week was pretty lazy and sociable. My guilt about unproductivity is assuaged by the fact that I need to make the most of people before I leave – now in 10 days! Thursday I went to the JFCC (Jakarta Foreign Correspondents Club) event, for the first time, to meet with a (female) Reuters journalist I hit it off with months ago. Friday I had dinner with Berkeley and her history buff friend, who gave me useful quotes for the Jakarta’s secret history” piece I am working on. Saturday I went to a dinner party with my mum, hosted by a Filipino-American couple, and caught up with Lambchop, a former colleague who is likely to leave the paper in a matter of weeks. Today I met up with Cym for a delicious Thai meal and lots of fun chat about the future (she’s running off to New York this summer, then South America) and the Story. The week ahead is going to be full on, with packing everything in and meeting deadlines… not to mention simply packing… I’m trying to get a headstart by completing transcriptions for this article on Indonesian superheroes tonight, and then I should probably make a proper plan on the silver board to help me get everything done… the clock is ticking! 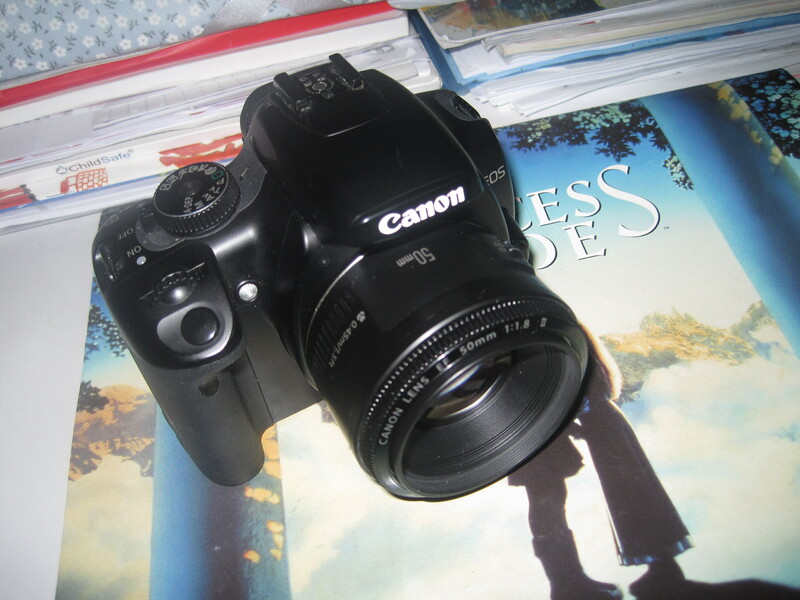 My Canon Rebel 400 snapped by my Canon Ixus 9515. 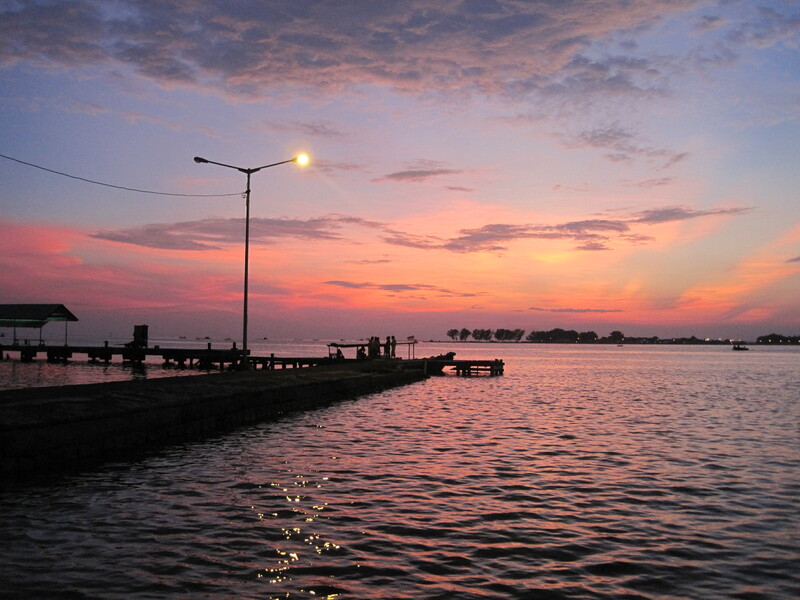 I am lucky enough to own two nice digital cameras – Canon Ixus 9515 and Canon Rebel 400 – and I have usually had at least one nice camera since my parents gave me my first digital 5 years ago for my first return to Cambodia – but I have always been sporadic when it comes to photography. Unlike my mother, who is a rabid photographer. She believes “no one will believe it happened unless there’s a picture”. I’ve been forced to stand next to countless road signs, had my appetite pushed to the brink as each dish of food is snapped a dozen times and constantly humiliated when asked to pose next to various colorful characters, such as Masai and London punks. I often feel my mother’s desire to document everything taints the actual experience, so I have rebelled in my own way, by being almost exactly opposite. I would far prefer the memory to the photo – I am fortunate that I have an almost cinematic (rather than photographic) memory when it comes to events. Still, there is a good pay-off when it comes to my mum’s incessant documentation – we have piles and piles of lovingly put together photo albums, which I do enjoy looking through. And I recently realized that I want to have my own collection. Plus, as a journalist, taking my own shots – and taking them competently – is a boon. So I have started to try and take more photos, both for the memories and to improve my skills. To that end I have recently signed up for the 365 challenge, which is simply to take at least one photo every day for 365 days. The next 365 days should certainly see some interesting events and trips: moving back to London; visiting somewhere in Europe with Anne; flyby to New York; Texas to see Tofu and Avis; return to studenthood; 25th birthday; seeing my parents in their new home in Nepal. And who knows what else! 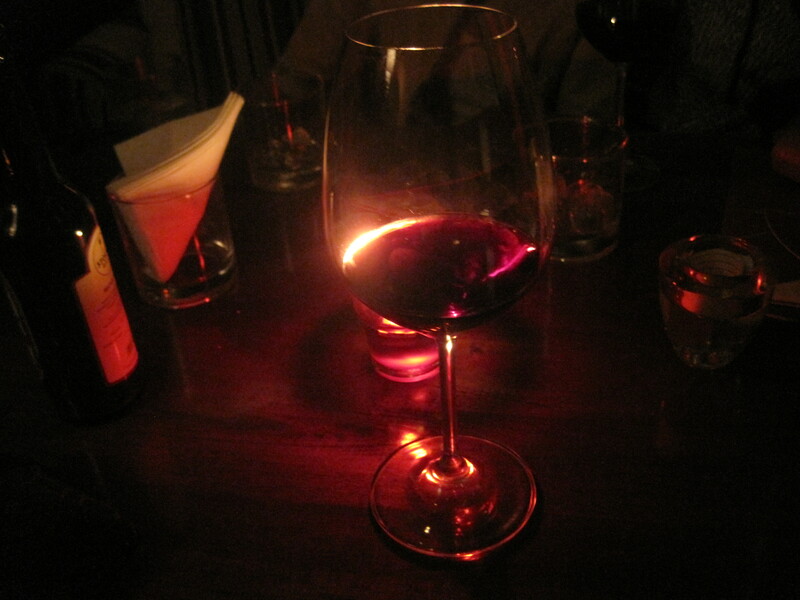 Glass of red wine at the Elbow Rooms, for the birthday drinks of Meli’s new housemate. Today I became certain about returning to the UK in 3.5 weeks. Drinking wine is one of the things I miss most from back home. We can do it in Jakarta too but at a price – this mediocre bottle set us back Rp. 500,000 (£40)! So I am looking forward to returning to London, but also enjoying the time I have left here. We had a decadent brunch at the Marriott, the first time we’d tried eating there. Still prefer the Ritz, but I enjoyed gorging on sashimi, oysters and sparkling wine. 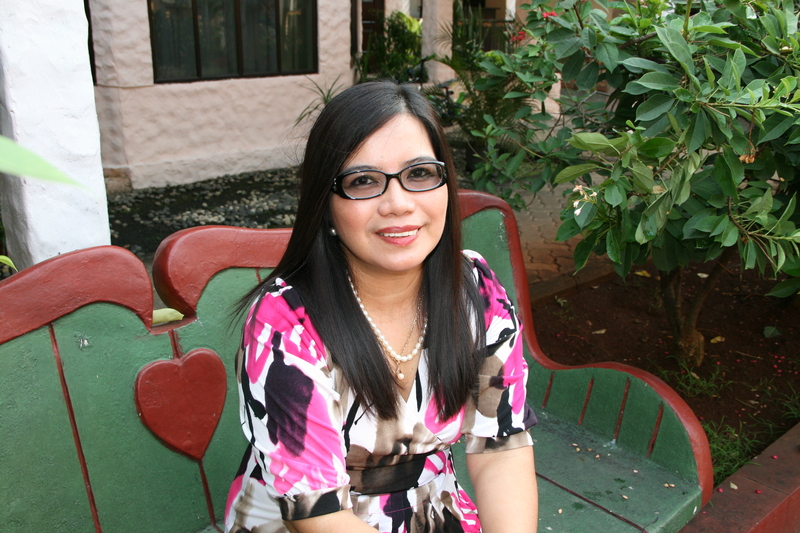 As a present to Mummy, I had a mini photo shoot with her around the compound. She was very game and annoyingly photogenic – I hope I age as well as she does! 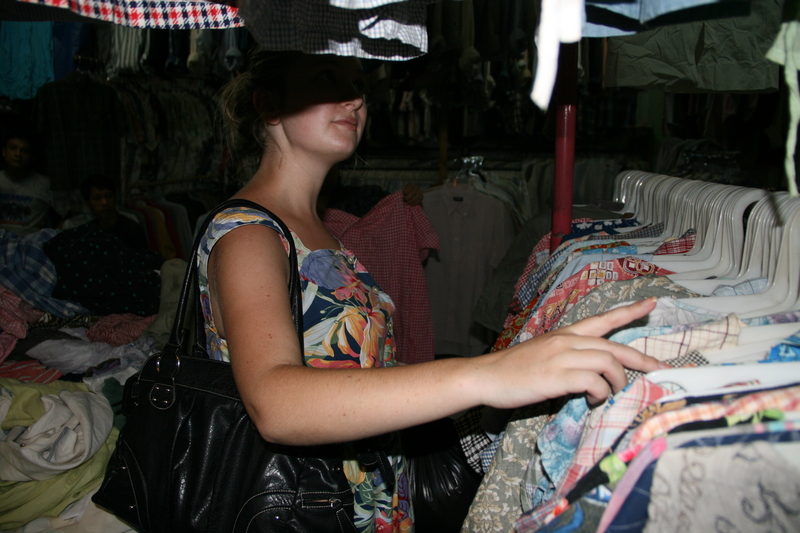 Meli browsing for dresses at Pasar Senen. She had Monday off and tagged along when I went to change my air tickets at Malaysian Airlines at the World Trade Center. She suggested we check out Pasar Senen afterwards, as I’d never been there. It’s a massive market that has just about everything. We were after cheap as chips secondhand dresses, which we found in spades. I bought seven dresses and one handbag, for a grand total of Rp. 260,000. It wasn’t a particularly pleasant experience, but I was glad to have seen it at least once – and the savings were worth it! How adorable is this little girl? And cool. She is so incredibly Cool. I didn’t think this was going to be today’s picture, it just happened that way. 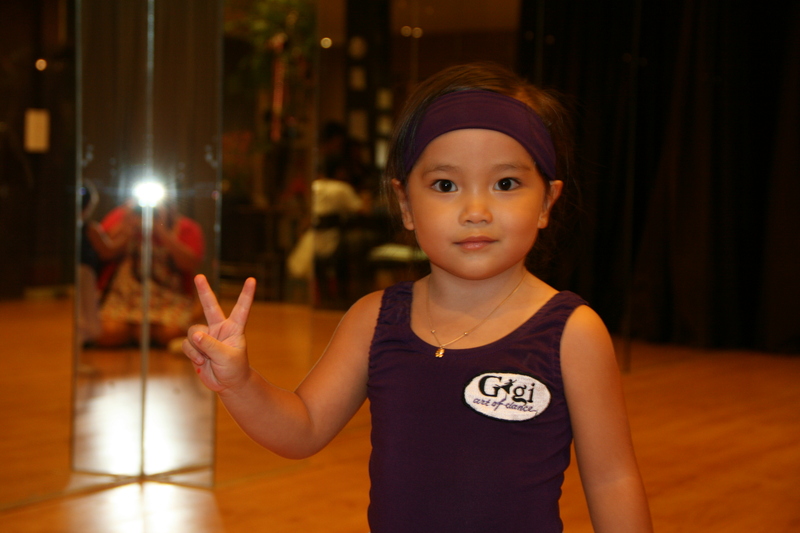 I went to Gigi dance studios to watch auditions for Joko Anwar’s musical Onrop (out later this year) and snapped away at the last set of dancers, after I worked up the courage to ask Joko permission. When the auditions were over, these tiny ballerinas began filtering in… I asked their teacher if I could take pics, and she obliged… and they quite quickly warmed up to the camera. When I left this man (who I assume works at the studio) asked me if I was the mother of any of the little dancers. I sheepishly admitted I was not… but I offered to email them the pics I had taken, which pleased him greatly (and hopefully took the edge off my possible creepiness). 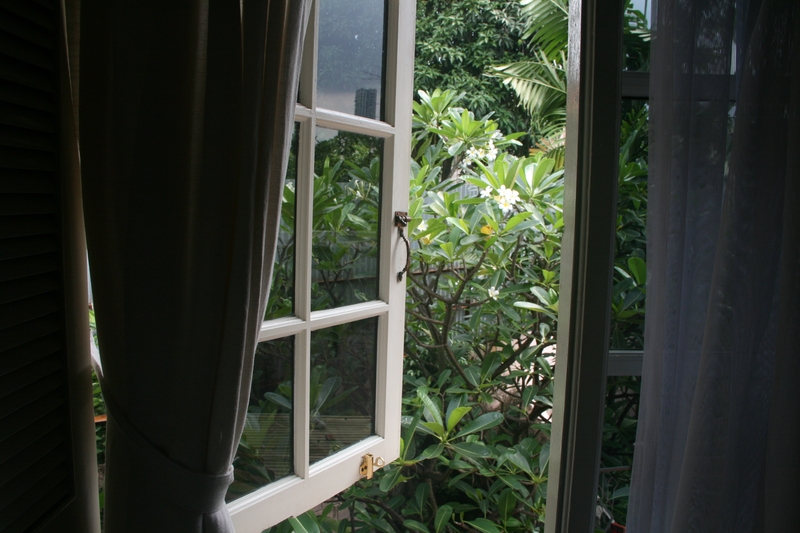 One of those days I treasure, where I don’t have to go anywhere at all. 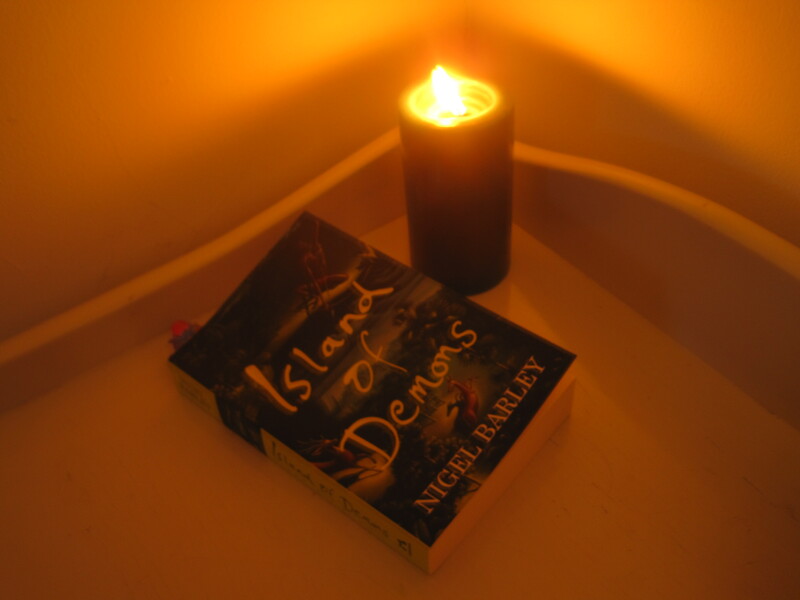 I was mainly focused on finishing Nigel Barley’s Island of Demons, which I am reviewing for the paper, and watching S5 of Supernatural, which is rife with angels and demons. The green of the book matched the herbal candle my fortmer colleague Scotia gave me for my birthday. On my way back from the salon. 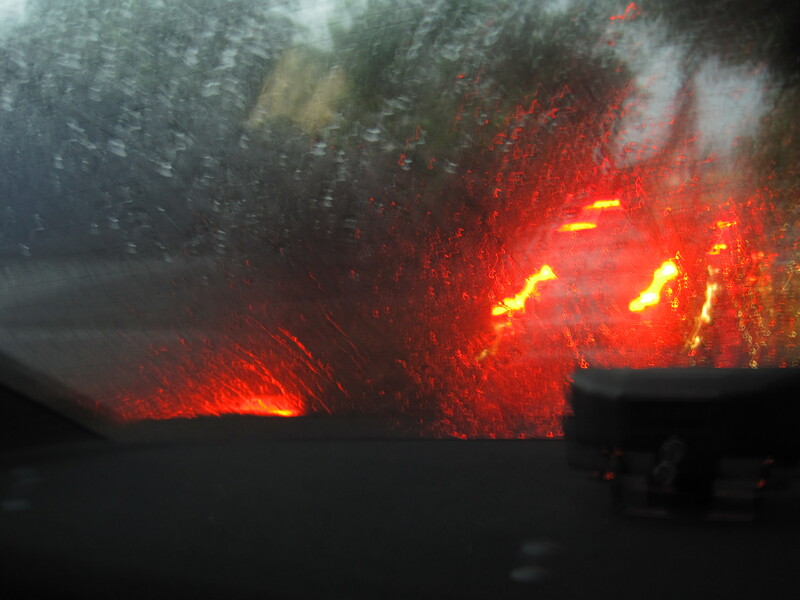 The roads were crazily flooded, and of course, traffic-jammed to hell. Being able to afford to go to the salon every week is something I will miss – getting stuck in traffic is something I won’t! This was the best of a bad lot of photos, I like how from a distance it evokes a volcano, which is like the moods I used to get in about traffic here. If you’d like to track my 365, bookmark this page. I’m going to the beach early tomorrow morning with Berkeley, who is a skilled photojournalist, so hopefully that means some prettier, more adventurous photos – and a tan. 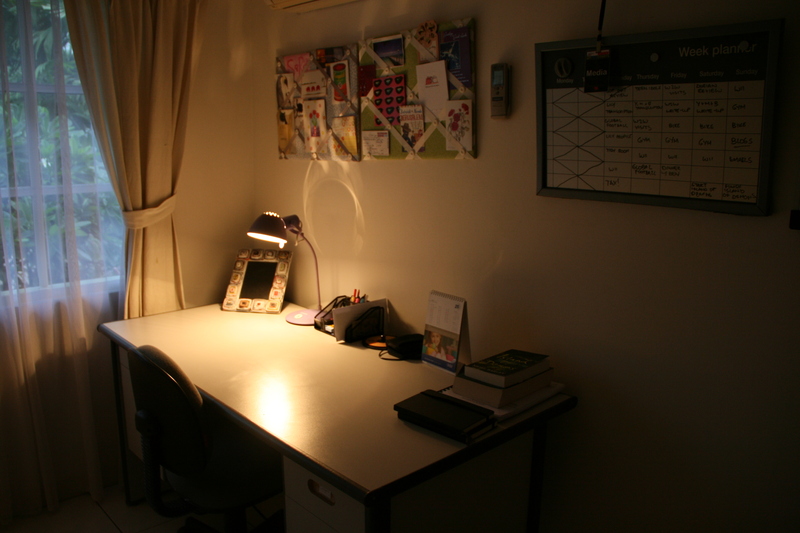 My workspace. I rarely sit at the desk but it being there helps me get stuff done. This week things are looking much clearer. I return to London June 2, in exactly three weeks and a week earlier than I planned as my passport has only one page left, post-visa extension, and I must leave before June 5 – no trip to Phnom Penh either, as I’d hoped. But it feels like it’s all meant to be. I’ve even got a real home to go to as soon as I get there, at my friend Haywood’s apartment in Brick Lane. She’s based in Los Angeles now, and the other two tenants are 30something media types, which sounds good to me. I don’t think I could live with a close friend again and I’m hoping that the fact my future housemates are older than me means they’re more mature too! T-Lady used to live in that very flat, so I know it will be a lovely place to be. The job front is still very uncertain. I’m ashamed to admit it, but I’m craving a 9-5 job. I’ve been a freelance journalist for about six weeks now, and it’s quite tiring. (I am also ashamed it’s only been six weeks and I feel like giving up!) I haven’t worked myself to death or anything (far from it), and I am starting to find my feet and a sense of discipline, but I always feel like I should/could be doing something I’m not. It’s hard to draw boundaries between work and leisure. Plus, my capacity for creativity far exceeds my rate of productivity – I have 26 stories on the go. That’s better than the inverse, but it also means that ideas can become old, which puts me off working on them. 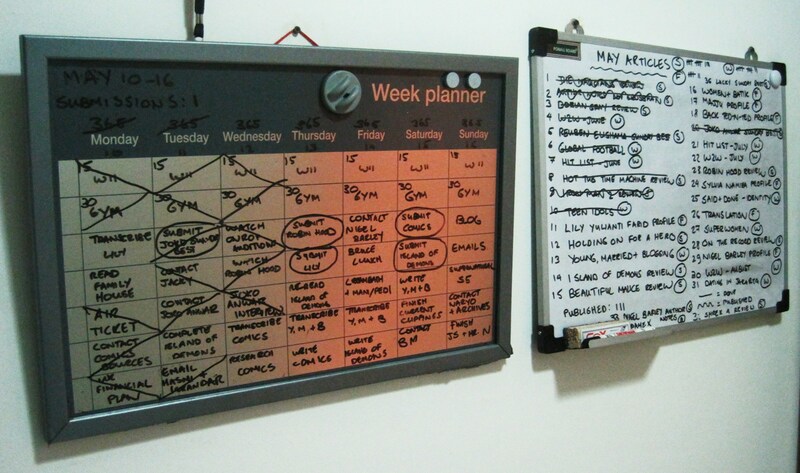 I used the silver schedule board to plan out my week, breaking up the things I need to get done into manageable chunks, and making sure to factor in non-work activities like fitness and socialising. The aim is to get all the day’s tasks done that day, but I can do other ones in advance and catch up when I’ve missed things out. Like I didn’t work out on Monday, and I’m meant to do at least 30 minutes a day, so I did one hour yesterday. I also didn’t do any Wii until today (meant to be 15 mins per day), so I had a 45 minute session. I haven’t had a “perfect week” yet – but that could be this week! It gives me a real sense of achievement to be able to tick things off. The whiteboard has all my assignments for the month, to help me keep track of what to do, what’s been done and what’s been published. It’s very motivating. I have a fantasy of finishing everything on the board before I leave… but as long as I hit the mid-20s, I’ll be happy! It also helps me see which sections of the paper I’m writing for. Sunday wants to mix it up with contributors so I’m no longer able to count on publishing four or so articles a week with them, which means I need to think of ideas that would work well for Features, to ensure I’m publishing enough to pay the bills. One thing that I also have to face, looking at my boards, is the fear that I have yet to conquer. I really should be approaching other publications. It’s not sustainable to only write for The Jakarta Post. I keep promising myself that I will do it eventually, but it’s too intimidating, and I keep using the excuse of all the other assignments I have to do. Next week I’ll actually write some steps towards it on the board, ie compile a list of contacts to approach, brainstorm ideas to pitch – then it’s more likely to get done. Nonetheless, knowing that I likely won’t be a full-time freelancer in the near-ish future helps me to appreciate that I am doing it, much like being in Jakarta at all. Plus, it’s going to keep me going until I do find that job, even while in London – I’m lining up commissions to do throughout June. I’m going to make the most of these three remaining weeks! Oh golly, just looking at these cupcakes – which are THE BEST I have ever eaten, even trumping the Hummingbird Bakery – makes me want to pack in the newly minted health kick and scarf down a dozen. Do they do delivery? Drool. Anyway, I’m not meant to be writing about how scrumptious these cupcakes are, but about how I’ve been pondering how you simply can’t have everything you want all at once. There’s always something that needs to be sacrificed. 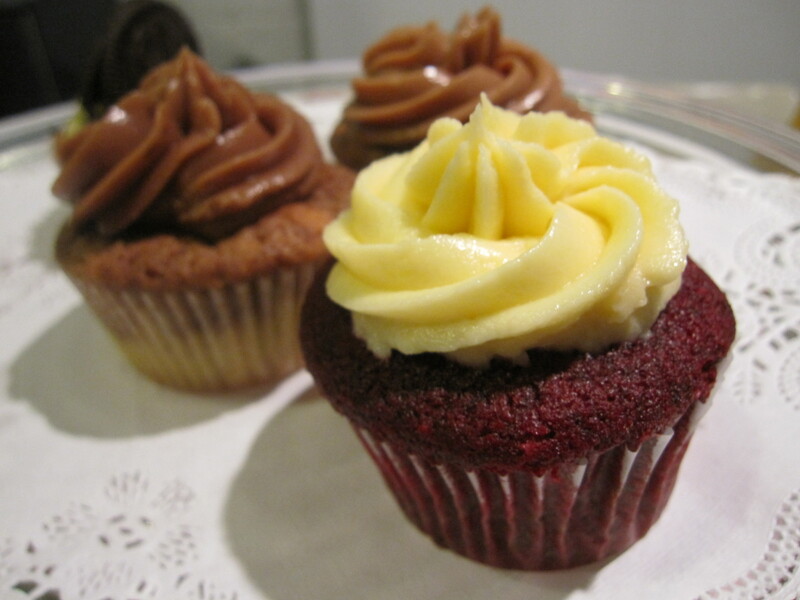 You can’t always have your cupcake and eat it (not that I really get that phrase, because when I get a cupcake, especially if it’s a Tea Party one, it’s just about physically impossible that I won’t eat it). Like in London, I had great friends, independence and constantly evolving love for the city, but not my family, financial security or a job that was a real rung on the career ladder I wanted to be on. In Jakarta, it’s been exactly the opposite. I’ve had a break from real financial worries, lots of family time and a fantastic opportunity to beef up my journalism portfolio… but the lack of independence, genuine friendships and city-wandering has really taken its toll. Pygmy pointed it out to me when we G-Chatted about it – I am starting to shut down. I feel myself becoming someone I really don’t like – complacent, bitter and cold. So what to do now? Well, at least the universe has begun to throw me some suggestions. I’ve been offered a place on a fast-track journalism course… it’s not such a surprise that I was accepted, but what was surprising was how much I realized I wanted it once I got the offer. I’ve had SO many rejections lately! And even better, I got some really great feedback too about my submissions, which was a boost I did quite need. So now it looks like I’ll be back in the UK in just over a month, on the offchance I get shortlisted for the interview for the bursary I will need to be able to do the course full-time. I’m thinking if the bursary doesn’t pan out, I’d like to do the course part-time alongside a full-time job. So this summer’s going to be about finding a job that fits the bill – and pays the bills. Whatever job I get, I won’t have to stop writing articles, and it might free more time for me to work on the Story. I’ve been learning it’s really tricky balancing writing articles with trying to write a novel, although I guess it’s a matter of discipline and practice. The sacrifices in this scenario are my plan of being completely freelance, returning to the UK to work before I meant to and having my family close-by, at least once the summer is over and they go on to wherever they’re going (my dad’s next posting is still unconfirmed). Texas might be dashed too, but I still hope to make that happen. I long to see T-Lady and Avis, and just have a different sort of adventure. I am also giving up being too demanding of myself – I think whatever happens this summer, I should lower my expectations, about fitting back into my friends lives, about where I should be careerwise, even about who I should be… and simply learn how to enjoy life again. You’ve heard of the Grasshopper and the Ant, right? 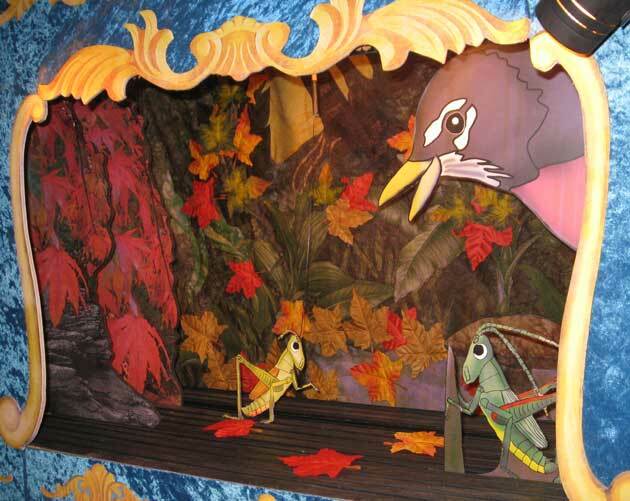 As the fables goes, the grasshopper spends the summer singing while the hardworking ant focuses on storing food for the winter. When winter comes, the grasshopper has no food and asks the ant for help, only to be rebuked for its idleness. Then the grasshopper dies. I always thought the ant was rather mean, then again, I am definitely a grasshopper. I need to be more like an ant. I’ve been in Jakarta exactly 13 months. Although I spent 12 of those months working like an ant, like a grasshopper I still have no savings, and health-wise, I’m worse than ever. This has been a lean month, for various reasons, and I was not prepared for it at all. Still, on the plus-side, I have no more pressing debts and some portfolio-worthy articles under my belt. And a job I endured for a whole year on my CV – it’s a record! But still, I do feel lame at 24 that I still not have learned how to save money. (I wrote “have not been able to” but then I realized that it was certainly possible, looking around at my stuffed bookshelf and rather ridiculous set of perfumes on my dressing table. And my nice netbook and SLR camera. I do not have money, I have things. ) 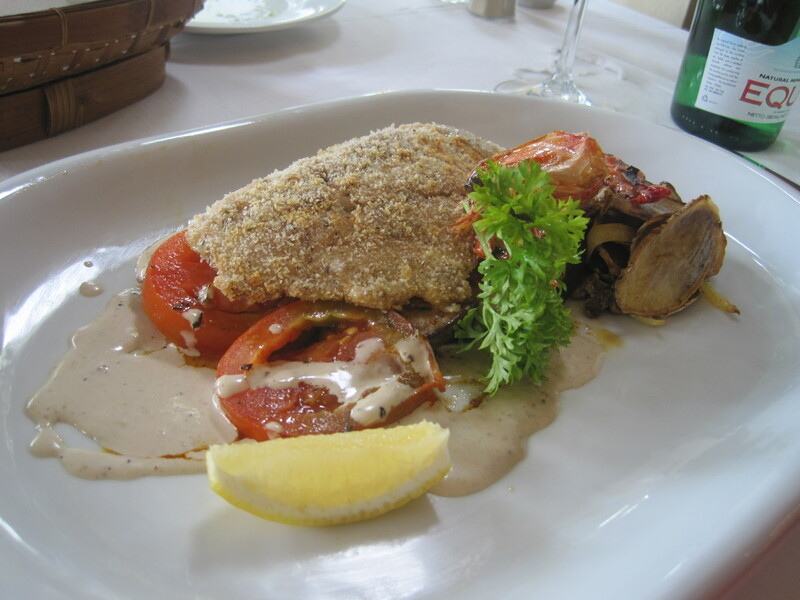 And fun memories of the various ways I spent the money (some travel, lots of nice lunches). I don’t think I wasted it really… but I should have put at least a bit more aside every month. After I managed to pay off a huge debt back in December I got carried away with not having to do it anymore. Add that to the challenges of being my own boss, and ends are not quite being met at the moment. Unsurprisingly, I keep having crises. I veer from hope and optimism to panic and back again. Yesterday I felt like I didn’t want to pursue journalism at all anymore, that I’d never be good enough, that I’d never make it. I’ve had loads of rejections lately, and I’m sure there are more to come. And far too many “birds in the bush” job offers. Being a freelance journalist is obviously quite challenging, in terms of discipline and opportunities, and I’ve realized that maybe I’m not quite ready for it. I think I need to work on another publication as I still have a lot to learn. Plus I love devoting myself to every aspect of the process, from commissioning to layout. Maybe I’m too emotionally invested for a freelancer. So. All these questions and doubts. After realizing I didn’t want to be in Jakarta much longer nor did I feel ready to go back to the UK, I’ve come up with a tentative, very grasshopper-like plan to run away to Texas and stay with my newlwed pals T-Lady and Avis, with New York, New Orleans, San Francisco and Los Angeles also on the tentative itinerary. I can just about afford the tickets, and if I can pull it together this month, I hope to have enough cash to stretch for a frugal but head-clearing American summer. And maybe when I come back – whether it’shere or the UK – I will be ready to start working on being an ant – there’ll still be a few months before the winter sets in. 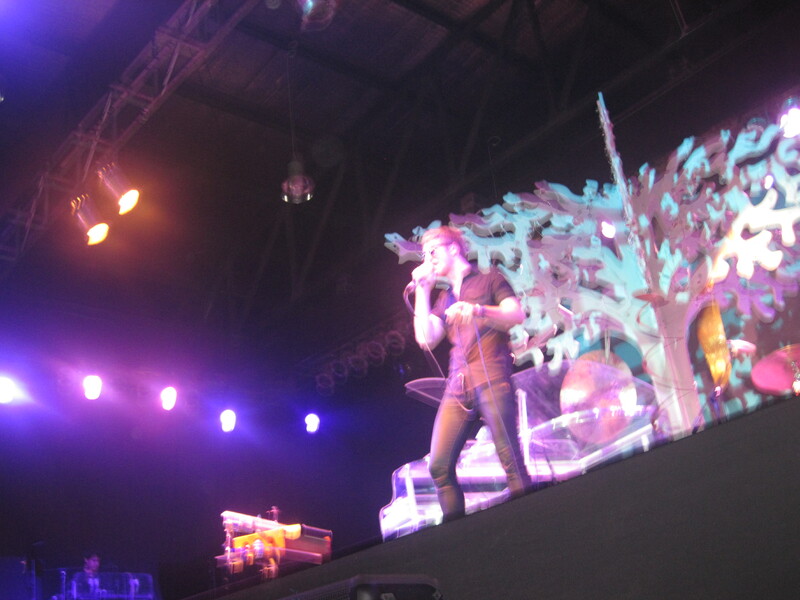 April 18, 2010 in life, snapshots | Tags: nights to remember | Enter your password to view comments. 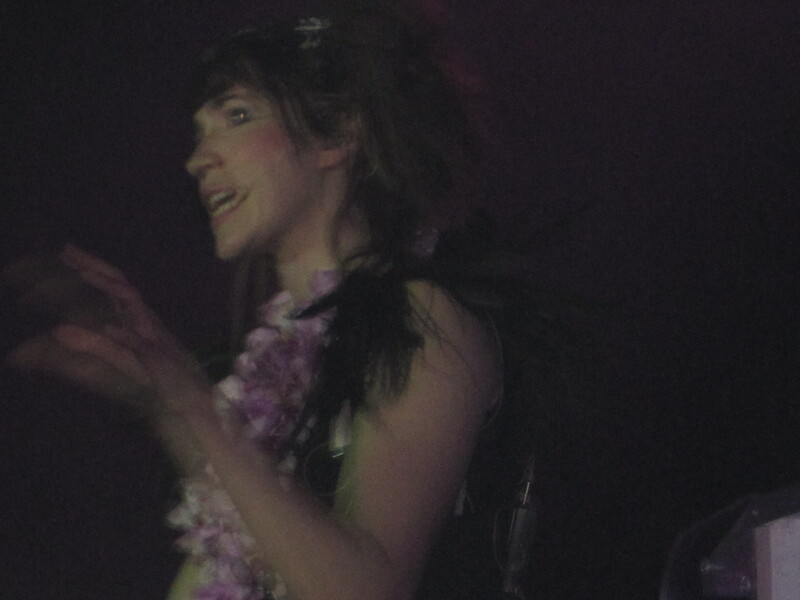 Imogen Heap in the middle of singing "Bad Body Double". I think that guy might be her lover! 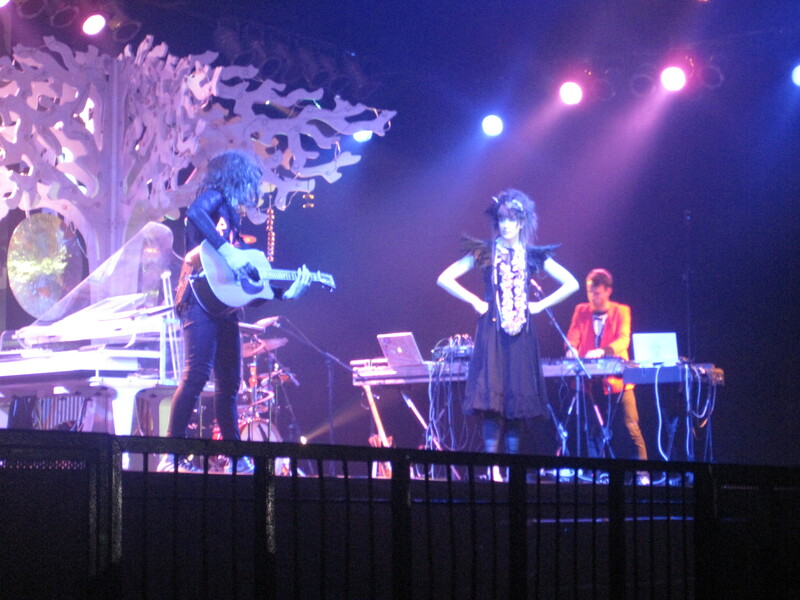 I had a pretty terrible day yesterday, in the way days in Jakarta can be, but all was redressed by the healing magic of one of my favorite musicians, Imogen Heap, who performed in Jakarta last night for the very first time. And I got to meet her! I actually interviewed her over the phone for a lifestyle magazine a few weeks ago, and it went well enough (despite my nervousness, it being my first phone interview ever) that she said (perhaps only politely) that I should “come say hi” at the concert. I didn’t count on it though. And the night didn’t bode well. Our lovely plans to have dinner at this Moroccan restaurant I’ve been longing to try were thwarted by Jakarta traffic (of course! ), so after I grabbed tickets and my media kit (I was reviewing the event), we (friend Meli and baby sister Nadine) attempted to find an eaterie, and settled on this rather suspect looking place. Just after had I ordered from the less than seductive menu I received a rather grumpy phone call from the newspaper photographer, who said I had taken HIS media pass. Yep, I did have two. I had not been informed a photographer would be sent – I had expected to take them myself. So I abandoned my impending dinner and walked back the two blocks to hand it to him. The media frenzy was bigger than any I had seen so far at a concert in Jakarta, so I realized it was probably best I didn’t go back to eat, and stayed put. Cym, my former Features and Sunday paper boss was already at the venue anyway, having cleverly filled her stomach at the Moroccan restaurant Meli, Nadine and I had never made it to. I chatted to Cym for awhile before being herded into the “media holding pen”, where we media types all waited aimlessly, phallic cameras in tow, until it was finally time to go into the concert – deliberately delayed by Imogen as she’d heard about the traffic – and for us to scrum in the “media pit”. I had preferred to sit in my front-row VIP seat I had actually shelled out for months ago (seeing as I don’t count on free tickets for events I definitely want to go to), but no, I HAD to be in the pit for the opening acts and the first three songs of Imogen’s set. The pit was ok, but tiring. I was able to get closer pictures than I would have otherwise, although I failed to figure out how to get my newly acquired SLR to take decent shots in the dark, so pulled out my tiny blue point and click. 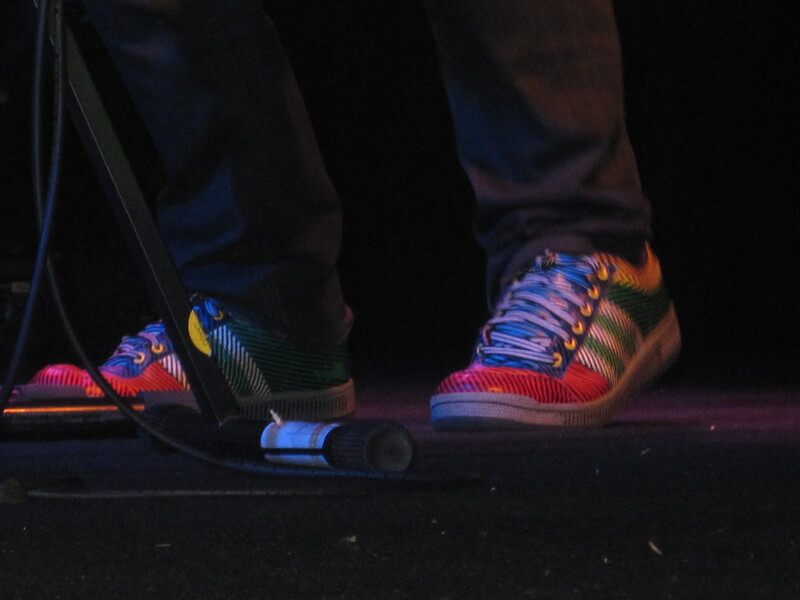 I got pretty into snapping shots, especially of cool shoes, but was chastened when I got told off for having my flash on. Felt like such an amateur! The first two acts were pretty good. There was Back Ted-N-Ted, a “disco pop rocker” from Arizona, who reminded me strongly of Alan Tudyk, and evidently got the hearts of the female journos around me racing. Back Ted-N-Ted - Wash's younger brother? 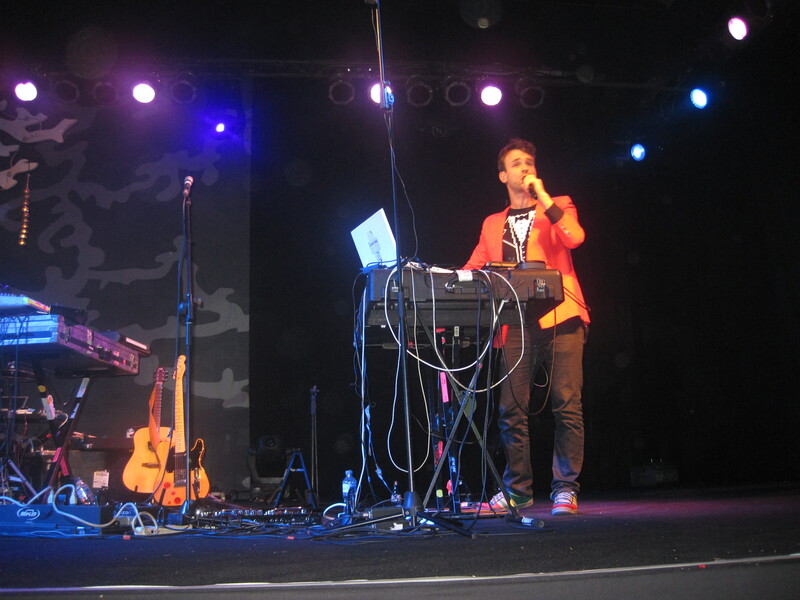 He was followed by Tim Exile, a British experimental artist who did lots of running around and improv. Tim was really good fun, kind of like a a futuristic, supercool children’s entertainer, altho I initially had this sudden fear he was actually this guy I had an intense two-night-stand with, who threatened to either run off to India to discover himself or go into advertising. (And therefore, could possibly be accompanying Imogen Heap on a world tour.). But it definitely wasn’t. Tim Exile in a rare static moment. Finally, it was time for Imogen to come in. I couldn’t wait for the three songs to be over, so I could chill in my seat, but luckily, the three songs were entrancing enough it didn’t feel like I was killing time. After we were vamoosed from the pit I gleefully took my rightful place besides Meli, Cym and Nadine, and settled in to watch the show. Hands down, it was the best concert I have EVER been too. I know I throw the word EVER around a lot, but I truly mean it. It tops the time I successfully stalked Princess Diaries boy to the Camden Barfly, blissed out to his tunes and nabbed his phone number. 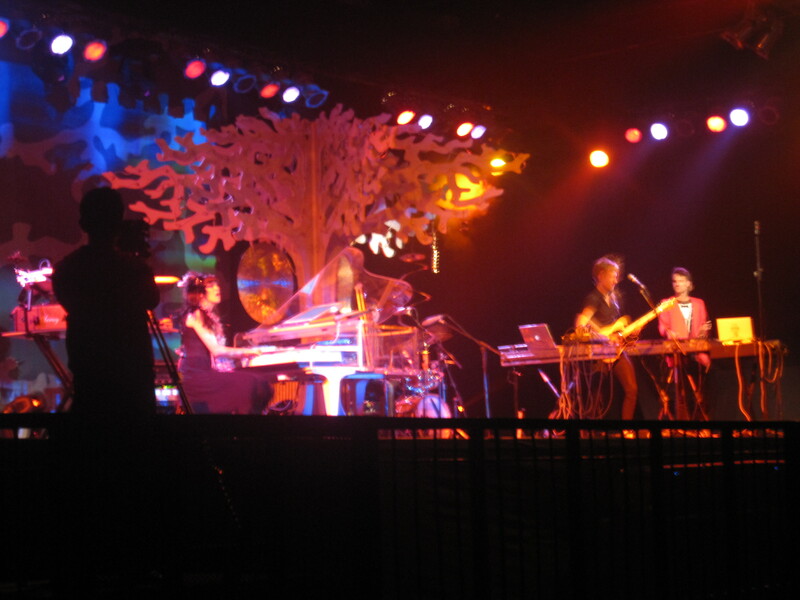 The stage looked absolutely magical – like a fairy glen – and the wonderfully dressed Miss Heap owned it, darting back and forth, and offering effortlessly witty quips between songs. I loved how she gave a little bit of the background before each one, which showed the personal process behind it, and how she seemed to really care how the audience was responding. The magical fairy glade of a stage. She had a seemingly endless array of unusual instruments that she taught us about as she went along, from this “water chords” thing that made “instant horror music” and a “snake” that made a whirly, whoopy sound as she spun it above her head. The thing is, she has a lot of props, but more importantly, she has the basics to back it up – a unique, powerful voice and mad piano skillz. I think every song that I wanted to be played was – I especially enjoyed “Goodnight and Go”, “Bad Body Double” and “Speeding Cars”. Sadly the best close-up of Imogen I managed to take. The concert went on for much longer than I expect – two hours (just Imogen, not the support) – and I was really looking forward to bed when it was done. But I thought about what Imogen had said… I realized that I probably should have put in the request to “come say hi” earlier, when I was dealing with the media coordinator… who knew if they’d even be sticking around afterwards? Still, I decided to give it a shot, and talked to one of the backstage guys, who was quite dismissive and offputting, and quite forcefully told me that my media pass no longer had any more power. 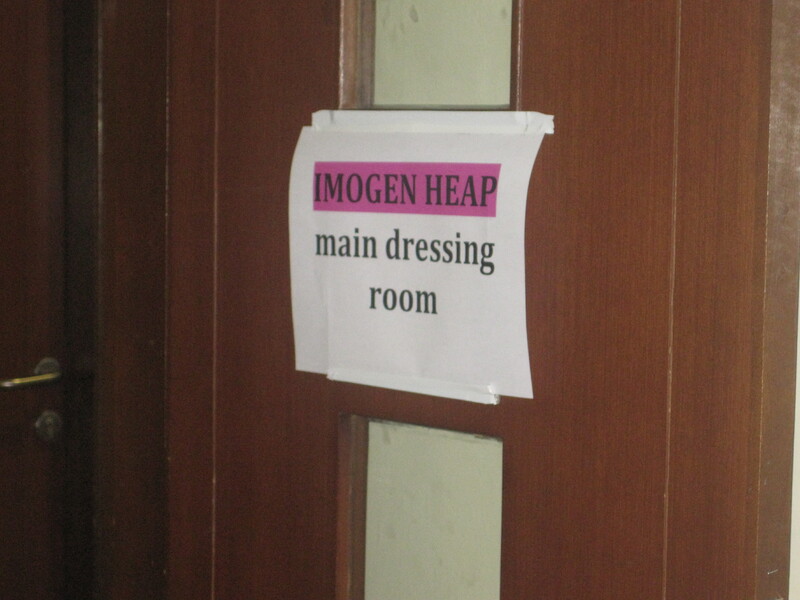 I threw around the full names of Imogen’s assistants, which probably helped, and mentioned the interview I had done. Some other backstage person came forth and asked us if we were “the four people who had been invited backstage” and it was so tempting to say yes, but I said no, feebly repeating that “Imogen just said I should ‘come and say hi'”. He disappeared again, telling us to wait, and we did, suspecting it would be forever… then Tim Exile came wandering down.My sister had been especially dazzled by his performance, so I introduced myself and the rest of us across the barrier, and he came behind to talk to us. We had a really fun conversation – I realized how much easier I find English men to talk to than say Indonesian, American or Australian – and at some point, I asked him if he could give Imogen the copy of the magazine with her interview in it. And he managed to get us backstage!! We promised to be all cool and stuff, which I think we were pretty much. We held off on requesting signatures and photos (after all, I had definitely abused her pretty shoes with my camera). Imogen was wonderfully warm and friendly, even poured us wine. The backstage was quite pleasant, they’d made it cosy with lots of refreshments, including cheesesand sushi. And we got to chat to Tim Exile some more, as well as Back Ted-N-Ted, who both plan to return to Jakarta. The Big Durian made a surprisingly good impression on them! Imogen was predictably in demand, so sometimes we were just in the small refreshments room by ourselves, and when we drained our wine and decided to head off, I said made sure to say bye to Imogen, who was way up on the stage. I hoped simply for a wave back but she actually jumped off and gave us all huge hugs. I got two! We were all giddy in the car on the way back… it’s definitely a night to treasure. The view from my new "office"
Or at least, it should feel that way, if I could summon up the energy. I have a slight hangover from drinking champagne with my colleague last night until 3 a.m. and accumulated exhaustion from a stomach bug since Thursday. Start as you mean to go on! Yesterday was my last day as a subeditor for a national newspaper. I chose not to renew my contract, and instead will attempt to sustain myself as a freelance journalist for the foreseeable future. I have applied for a number of other commitments, but the earliest one starts in July, and all are long shots. So, for now, I am My Own Boss. My office will be in the glorified walk-in closet attached to my bedroom, my workwear for at least the next two days will be pajamas and I’ll be grabbing meals directly from the refrigerator. I really am happy though, deep down. I felt trapped in my past job, with the unsociable hours, long commute and tedious work (I found that I really really do not enjoy subediting! ), and I made up for it by throwing myself into writing articles. My whole life has been work (and family) for a year, at the expense of other things like health and friendships. It’s time to find a balance again. Along with continuing to focus on journalism and creative writing, I hope to revive activities that have lain dormant for too long, like cooking, twirling and scribbling. I also plan to improve my photography, both as a creative outlet and to assist with my professional work. This first week as an unemployed bum is pretty gainful though, which means I won’t be able to panic about having removed the safety net of a guaranteed paycheck. I have nine articles to complete by Friday, an Imogen Heap concert Wednesday night… and if I get everything done, four days in Phuket to look forward to, where I am promising myself I won’t do any work at all. 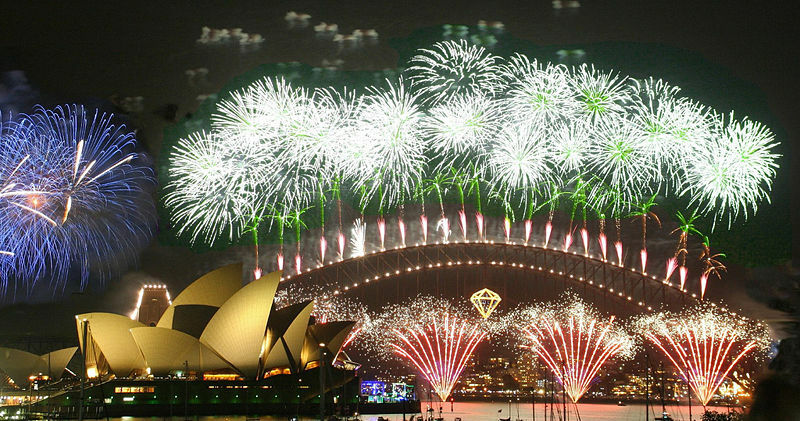 … is already well underway, gone in the blink of an eye, but here are some belated fireworks anyway, ones from Sydney, as I was there for New Year’s. I hope time continues to speed for the next eight weeks, because then I will be free of copy-editing! Which is both amazing and scary, because I’m not certain what I want to do afterwards. Or what anyone will hire me to do afterwards. I’m playing the applying game at the moment, applying to three money-draining things, ahem, writing workshops, and one money-making thing – a traineeship at The Times. I should also start applying for journalism bursaries and the like. I’m more or less ahead of schedule with the apps -they don’t start being due until March – but it will be a relief to have those lottery tickets released into the ether. While I wait for rejection, I can throw myself into being a bum, ahem, freelancer. Plans if nothing I’m apply for works out: stay in Jakarta until June/move to Cambodia and finish first draft of novel, visit the UK during the summer. I’ve been offered two potential jobs in PP, but they’re still birds in the bush, so I won’t speak of them until I get confirmation either way. 2009 was a Bad Year. I thought 2008 was a Bad Year, with the Masters’ stress, but it comparison to 2009, it was actually Alright. A Bad Year because of lost friendships, stress, money troubles… all this under the surface emotional stuff… but I guess on paper it actually looks decent, with working at Lambeth Palace and then going onto The Jakarta Post and being able to get back into the swing of feature-writing, which is the main thing keeping me going here. In other news, Anne and I have made headway on a new blog – Pop Culture Playpen, which comprises all our babble about pop culture, including past posts, articles and essays. It’s not “finished” yet, in terms of tagging, categorizing and sprinkling of images, but its almost there, and then we’ll let the world know about it a little more loudly. I'm 24 and based in Jakarta, but may not be for much longer. I grew up all over the world, but the place that feels most like home is the UK. I like stories, gastrobating, twirling and endless conversations.